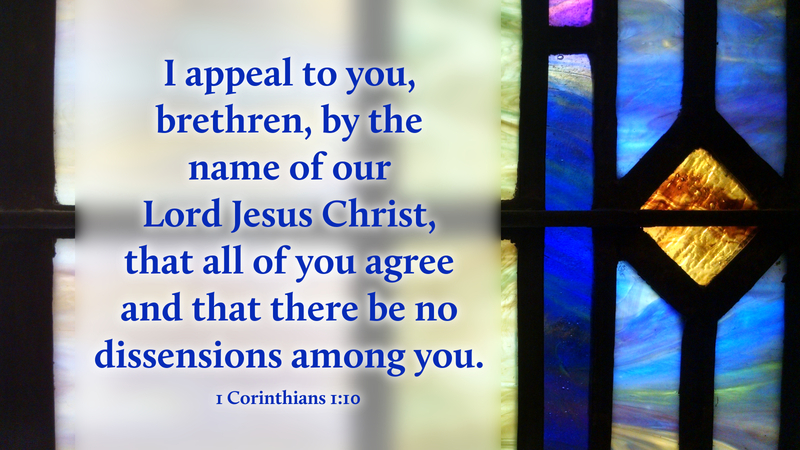 “I appeal to you, brethren, by the name of our Lord Jesus Christ, that all of you agree and that there be no dissensions among you, but that you be united in the same mind and the same judgment” (1 Cor 1:10). I once had a one-hour conversation with Roman Catholic Archbishop Charles Chaput, then Archbishop of Denver. In the course of our conversation, we quite naturally spoke of the great confusion and division within the Body of Christ, especially with regard to marriage, human sexuality, the value of human life and other issues which have split Christian denominations in general, and North American Lutheranism in particular, at this time in history. We agreed that our God is the God of harmony, unity and peace, while Satan is the lord of confusion and dissension. Surely the devil likes nothing more than to cause arguing, fighting and factions within the Body of Christ. Leading Christians away from the truth of Holy Scripture is surely one of the ways that Satan confuses and divides Christians today. And yet, has there ever been a Christian community where, as St. Paul writes, “all of you agree and there be no dissensions among you”? Certainly, we Lutherans played our part in schism within Christianity as the Reformation, although much needed, still brought about a split within the Church. Similarly, the Eastern Church is separated from the Western, Protestants from Roman Catholics, and within every denomination and congregation, there comes division and dissension. No one Christian community is immune to tension and disunity. And how do we deal with such things within the Church? There is only so much we can do to affect the larger Body of Christ, but we can have a great impact on our own small corner of Christianity within our own congregations. I wonder: If every local congregation would strive to have no dissensions and to be united in the same mind and the same judgment of Christ Jesus, would not this impact in some way the whole Body of Christ in the world? This season of Lent, let us commit ourselves to unity, harmony and peace, centered in the grace of God in Christ Jesus! Prayer: Lord our God, let us be united by the name of our Lord Jesus Christ, in our homes, our families, our congregation, and the Body of Christ in the world; through the same Jesus Christ, our Lord. Amen. I truly yearn for every congregation and the worldwide body of Christmas to be of one mind. It can never happen, although it is a worthy goal. It cannot happen, because baptized or not, every person is afflicted with sinful human nature. Any group, be it as small as the two become one in marriage, will simply not be in total harmony all the time. For the church, it is very important that we all be listening for the guidance of the Holy Spirit, and when there are differences, then we need to deal with them in love and grace. However, we should never paper over them and pretend that they do not exist. Truth in relationships is more important than a pretense at unity. If every person’s view is respected, then decisions can be made and action proceed without requiring anyone to lie about his understanding and sense of direction. Sometimes, if the process is respectful, the lone holdout will see the wisdom of the group’s decision. In fact, it even happens from time to time that the group comes to see that the lone holdout was in the right. It is possible for groups to agree that it is time to act, and that unity of respectful understanding will be the unity that gets God’s work done. I wish we could all agree, and I even pray for it, but never at the price of suppressing truth.